SALEM/WILLAMETTE VALLEY, Ore. (March 24, 2017) – Eola Hills, first winery in the Pacific Northwest to make a commitment to our region’s economic and fermentation future will be the first donor to the experimental vineyard to Clark College at Boschma Farms in Ridgefield, Washington. 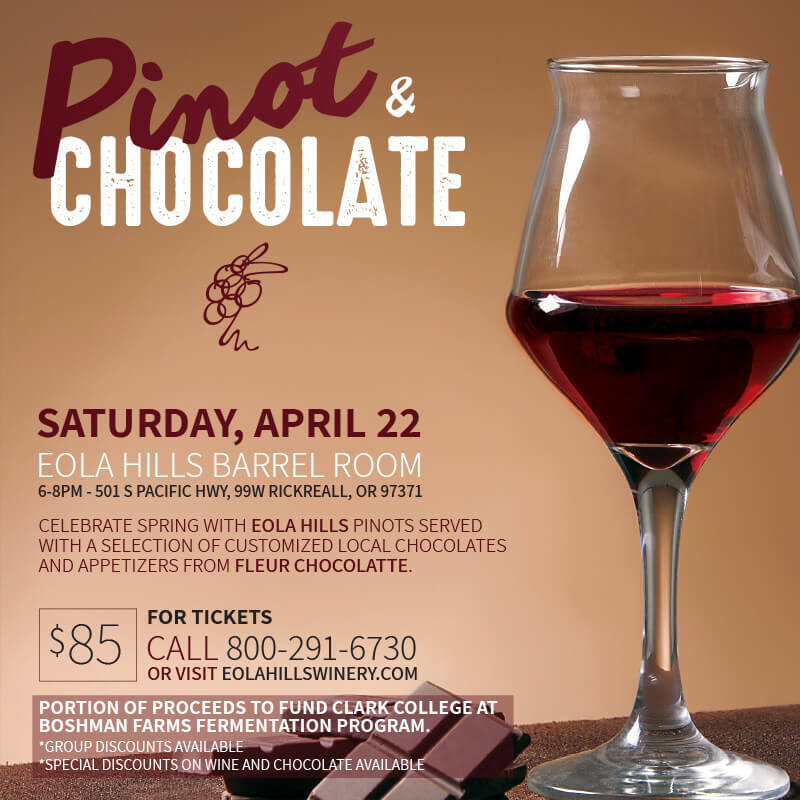 Pinot Noir and Chocolate will be hosted in the “Barrel Room” of Eola Hills Wine Cellars from 5 to 7 p.m. on Saturday, April 22nd. Tickets are $84. The event will feature six pairings of Pinot Noir with chocolates prepared by Fleur Chocolate and select appetizers. A colorful presentation on Clark College at Boschma Farms will be presented at 6 p.m. Total donations from this event are expected to raise between $10,000 and $20,000. Eola Hills founder Tom Huggins realizes that the wines and breweries of the Pacific Northwest, a sustainable and environmentally friendly economic boom, needs to put down more than roots. Fermentation education and standards drawn from the expertise of the Pacific Northwest’s pioneer vintners and brewers needs to be formalized. To do so takes more than education, it requires land combined with resources for curriculum development, equipment and laboratories. Huggins also believes this event will initiate an on-going coalition of support that includes funding from wine clubs, citizens committed to a sustainable economy, and other vintners and brewers in Oregon and Washington. His dream is that the Pacific Northwest will evolve into the winery and brewery center of the United States. Mike Sherlock of Fleur Chocolatte of Vancouver, Washington, along with Eola Hill’s vintner Steve Anderson will be on-hand to talk about each pairing. The Clark County Food & Wine Society will be pouring at the event and will explain to guests how they may contribute to the future of this experimental winery. Reservations are required, tickets (and group discounts) are available: 503-623-2405, 1-800-291-6730, eolahillswinery.com. About Eola Hills Wine Cellars. Three decades ago, Eola Hills founder Tom Huggins never imaged his dream of Eola Hills Wine Cellars would reach international attention. That dream is now a worldwide distributed label and Eola Hills is made up of six vineyards, over 300 planted acres, and an annual production of 93,000 cases of pinot noir and other varietals that have won international awards including Best Buy ratings year after year on their Pinot Noir, Pinot Gris, Chardonnay, and Sauvignon Blanc. Eola Hills Wine Cellars prides itself on producing a wine of great quality and consistency year after year. For more information: www.eolahillswinery.com.